It is no secret that we love PVC pipes turned into studio gear. 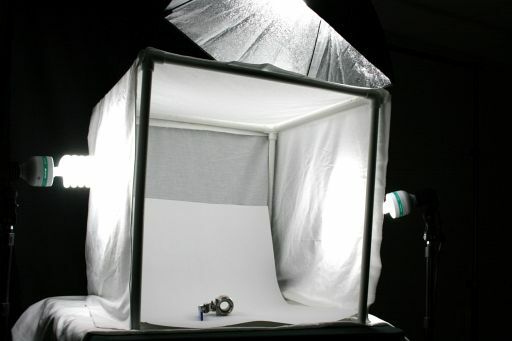 we teamed up with pvcfittingsonline to make this quick and fun light tent tutorial. I have noticed that there is a growing need for Etsy entrepreneurs, bloggers, and DIY geeks like myself, to buff up on our photography prowess. I’m sure you’ve seen and have possibly been the culprit of horrible photo documentation online. Why spend all that time working, writing, and prepping when your photos come out looking like a bad webcam experiment circa 1995? Taking all this into account, I decided my next project would be a DIY light box. The idea of a light box is to disperse light evenly within a space so the object you’re photographing can be seen clearly and usually with a solid background. That makes light boxes perfect for taking product pictures (which I sometimes need to do for work). This light box plan gives you a space of about 20 square inches inside the box. The materials are super cheap and easy to find. Follow along with my instructional video or the written instructions below. Here’s how I made mine! You can watch the video after the jump or go by the textual guide. 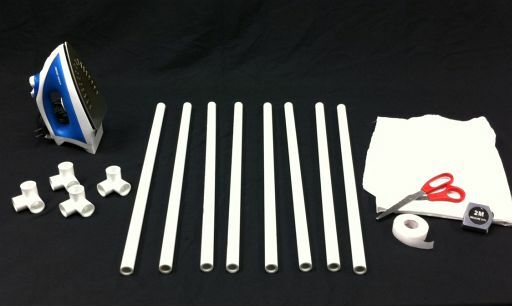 My plan calls for 8 sections of ½” size white PVC pipe, each 22” long. I used PVC cutters to get clean cuts, but you can also use a hand or power saw. You can find PVC cutting tools at the hardware store from around $10. If you ever expect to do another PVC project again, they are worth the investment. Most hardware stores sell PVC pipe in 10ft lengths, so I bought two and ended up with some leftover after cutting my 8 pieces. When your pipe is cut you can start fitting the frame together. 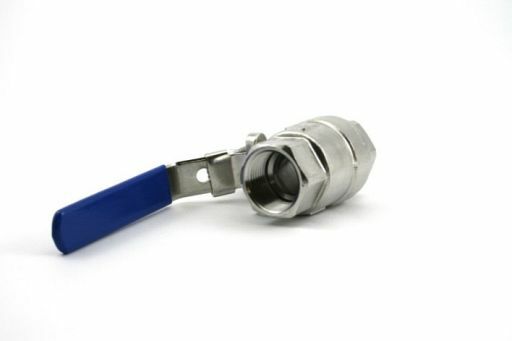 The four 3-Way fittings serve as corner pieces at the top of each of the four legs. I chose not to glue these together, because they fit snuggly already, and I have the option of taking the box apart for travel. Once the frame is assembled, set it on a flat solid surface and press down firmly on the top of each of the corners. This should level it out and make sure everything is firmly attached. Light boxes rely on light being able to penetrate the walls, so whatever material you use, it needs to let some light through. I chose to use white bed sheets because they are thin and can be purchased on the cheap at my local thrift store. The easiest way I could find to create the drape was to cut two pieces of fabric from the sheet. 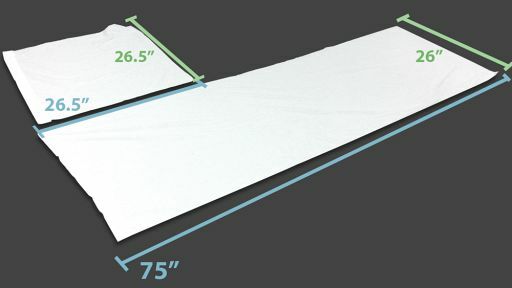 The first should be 75” x 26” and the second should be 26.5” square. 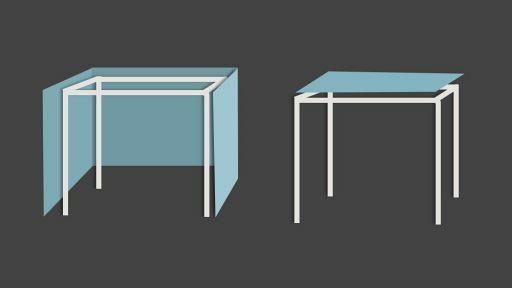 The long piece will wrap around the frame to create the right side, back, and left side. The square piece of fabric will form the top. This way we only have to bond three sides of fabric together. Since I’m no seamstress, I decided to use a quick no-sew method to bond the two pieces of fabric together. You can find no-sew hemming tape at your local craft or fabric store. It’s super easy to use. Just cut a piece and place it between the two pieces of fabric you want to join together. Then run a hot iron over the top of both pieces of fabric. The glue strip melts and cools to form a strong bond. Try to run the tape along the very edge of the fabric, so your drape fits over the frame and stays the correct shape. Once your drape is “sewn” together you can flip it inside out. This gives the outside appearance a clean finished look. Slip the drape over the PVC frame. It should be a nice fit. I used the left over parts of the bed sheet under the bottom of the box to keep everything inside a uniform white. To create a smooth background I placed a white poster board in the back of the light box. Use a support placed behind the back sheet to hold the poster up so it curves down to create a smooth look from the background to the foreground of the box. Step 6: Let There be Light! Luckily I already had some nice big florescent lights to use with my box. If you’re doing this at home you can use desk lamps or direct table lamps (office depot carries them at inexpensive prices) so they shine through the fabric into the light box. Usually you get the best effect by positioning bulbs directly outside (but not touching) the top, right, and left walls. 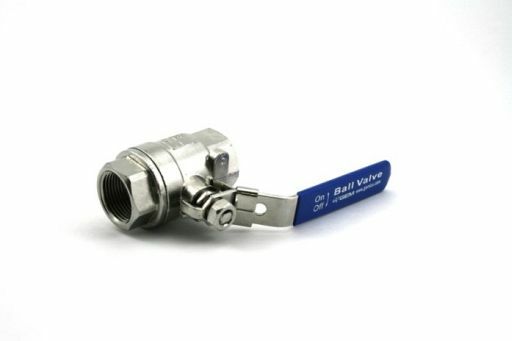 To test it out I took some quick photos of a stainless steel ball valve for work. I used a Cannon EOS Rebel on automatic. The only edits I made to the images are level adjustments in Photoshop. This just proves, though, that even we non-photo-gifted can improve our shots by putting some effort into the setup. You can see some darker corners where the poster board curves in. Those are some areas I could experiment with by repositioning the board or by just editing out later. Overall, I’m very happy about how well the light box came out. I’ll definitely be using it for my product photos going forward. It will save me lots of time spent on editing out ugly backgrounds and trying to get the lighting right. I recommend trying something similar if you are a craft blogger or online seller looking to improve your photos without shelling out the cash for a store bought setup. This DIY light box was surprisingly simple to make and gave me a huge sense of accomplishment – especially after seeing the pictures! If you try this or other DIY light box designs, please post or link us to your result photos. I’d love to see how it works for you! Amanda Hill is a part of the content team at pvcfittingsonline, a pvc fittings supplier for industrial, commercial and consumer customers. Amanda spends a lot of time crafting DIY projects to showcase the benefits of PVC products. You can learn more about all the projects created by visiting her on Google+. i’m not a shill for ebay, promise…and I love the DIY hacks, but for something like this, I think buying one is a better option. I suppose you can make an argument that if you have very unusual shaped products, then this DIY would give you the flexibility needed. Happy building! Largely agreed. And the ebay ones also pack away very nicely so they really can’t be beat. I make mine out of cardboard boxes and tissue paper, the thing here is you can change the sizes or toss out the boxes. it just seems to fit me better to do a large item then a small item on the cheap. Some people have plumbing tools and supplies sitting around from past projects. Also, didn’t the author say she didn’t glue it?…which would make it easy to dismantle to move to other locations (which would be a plus for me). I dare say many people already have old sheets on hand, I just tore up two queen sized whites for rags that I now wish I’d saved. Plus I have a sewing machine, basting a straight line to create tubes to slide the poles into would take me far less time than ironing them together. Even after adding the time to hacksaw the pipes I’d still be farther ahead to make it vs waiting days for an Ebay purchase to arrive in the mail. So I’d say the plus to this is that, assuming you’re a DIYer, you’d already have most of the tools and supplies on hand and can have a light box in an hour or two vs two to ten days depending on shipping times and postal traffic. Very Nice!!! I make a similar, view my tutorial. DIY Light Box 300Watts (CFL). What a clever idea. I’ve seen people make them out of styrofoam coolers too. I will share this with my blog readers for sure. Thanks for posting. What kind of lighting did you use? I’m going to be doing stills of bottled products. Currently I have no lighting. What’s a good kit to start out with? Did you hem the edges of the sheets? My pvc lightbox design rig, with an additional outside cage for hanging 18″ long fluorescent lights and a dual camera rail in front.